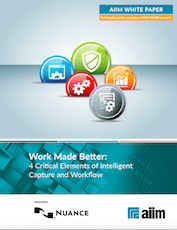 56% of respondents plan to automate more manual processes, while 30% will update capture systems with better technology. In 2017, paper should be as passé as the floppy disk or microfilm; but you only need to visit a local government agency, the doctor’s office, or perhaps, your personal workplace to see the 8x11 reality. Paper still has a strangle-hold on personal office space and throttles some of the most critical processes end users are tasked with.